Menu labeling laws are creating new jobs for RDs in nutrition analysis, menu development, and more. Despite challenging economic times, people are eating out more than ever. Certainly, today’s eating-out scene isn’t what it used to be. It’s no longer an occasional treat. In fact, it’s become mainstream. Part of the reason is that restaurants are reaching more people in more powerful ways. Social media, big-batch couponing, and targeted marketing and advertising are wildly popular, and restaurants often promote nutrition and health-related messages. All this demand for healthful restaurant fare has created abundant career opportunities for RDs. Experts believe the restaurant industry needs savvy dietitians in the areas of nutrition analysis, recipe makeovers, menu development for special dietary needs, and much more. Read on to find out about the career opportunities available in the restaurant industry and how much of a positive impact nutrition professionals can make. Some of the most important roles RDs can play in the restaurant industry include providing nutrition information, developing menus for special needs customers, helping with food safety and label regulation compliance, and marketing. Recipe analysis (technically “calculation”) via entry into a database program is the standard method, and many software choices exist. However, none of these programs currently run on a Mac. Mac users can either use a virtual Windows machine on their computer or a Web-based program. There are a few free-use websites, but they’re not the best choice for analysis because many aren’t up-to-date or accurate; fee-based programs offer better quality assurance and regular updates. It’s important to understand the limitations of nutrient analysis software and know how to manage unforeseen situations, such as variability in ingredients; lack of standardized recipes; ingredient substitutions; how different cooking methods impact outcome; adjusting the analysis for changing portion size; missing ingredient information; accounting for hard-to-calculate methods of preparation and ingredients such as deep frying, marinades, and stocks (industry standards exist for these); converting correctly between weight and volume; and calculating losses due to cooking (see Resources). Nutrient analysis is only one of many menu-consulting services RDs can provide to restaurants. Others include recipe creation, menu development, recipe makeovers for improved nutrient profiles, identification and development of selections that meet guidelines for specific diets and dietary restrictions, adaptation of recipes for health conditions, and assistance with increasing perceived healthfulness of menus (while improving marketability and return on investment). Dietitians with strong culinary backgrounds are ideal for assisting restaurants with developing new flavor profiles and ingredient combinations while meeting calorie and nutrient targets, sourcing fresh/local or unusual ingredients, and even helping with food budgeting. RDs also can train staff on topics that bring together nutrition and culinary arts in unique and interesting ways. Niche markets also provide consulting opportunities for dietitians, such as identifying and designing gluten- and allergen-free menu options; developing low-carb or low-fat dishes; promoting healthful kids’ meals; procuring local, organic, and/or sustainable ingredients; and developing vegetarian/vegan fare. Several of these endeavors can come together as one project by designing a unique menu labeling system in which symbols are used to indicate gluten free or vegan. Developing, defining criteria for, and implementing special dietary meals, such as heart-healthy choices, are other opportunities requiring dietitians’ expertise. In some cases, programs with nutrition criteria already exist, and the restaurant simply needs help identifying and developing menu items that meet this criteria. One example is the NRA’s Kids LiveWell program, which already has established criteria for its participating menu items. Making such significant alterations to a restaurant’s menu and overall image can be viewed as a financial risk for some restaurants, considering the costs associated with hiring an RD consultant and the possibility of losing customers. Fortunately, given that consumers often prefer more healthful options, increased business or the customers’ willingness to pay higher prices for these items can offset the costs. 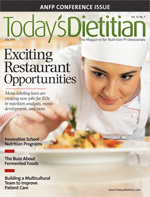 Another critical area of opportunity for dietitians in the restaurant industry is food safety. Becoming ServSafe certified is one way to get your foot in the door. RDs also can become involved with state-specific compliance measures with the department of health, front- and back-of-the-house food safety training programs, food allergen labeling, and food allergy protocol training, which entails the prevention of allergen cross-contamination. Sometimes restaurants want to focus on one aspect of nutrition and establish full programs. For example, a restaurant may want to be known for its allergen-free offerings. In this case, RDs wouldn’t only identify allergens in the menu items but also design an entire staff training program, develop special recipes and meal combinations, create a chart cross-referencing menu items and allergens, develop consumer education programs and materials, and evaluate success by tracking customer feedback and sales. Dietitians with experience in public relations and marketing are valuable additions to restaurant teams. For example, experts in customer relationship management give restaurants an edge with the use of social networking tools and social influence marketing. Being the healthy voice of a restaurant (which is invaluable for the establishment, rewarding, and a great deal of fun) can be accomplished through marketing materials, becoming a spokesperson, interviews, food demos, tastings, seminars, workshops, health fairs, lectures, and trade shows. Moreover, consumer behavior and psychology tie in nicely with dietitians’ services. If this is your strength, you can assist with dining room layout, art, menu redesign, identity development (eg, logo, feel, color scheme), and even rewriting the names and descriptions of menu items. For example, changing the menu descriptor from “Spicy Black Bean Spread” to “Velvety Black Bean Dip: a decadent, smoky purée with a hint of ancho chili and lime” can help boost sales significantly. These skills also can be used to promote the sales of the more healthful menu items. Tech-savvy dietitians are in high demand for their assistance in developing, testing, and ensuring accuracy and compliance with mobile and Web-based applications. Many restaurants are using advanced technology to display nutrition information in interactive, individualized, and creative ways. Dietitians are in high demand to help restaurants comply with menu labeling laws. In addition to providing soon-to-be-required nutrition information, such as calorie counts on menus, menu boards, food display tags, and at drive-thrus, restaurants will need assistance understanding health claims, FDA legislation, requirements, exemptions, and recommendations. Chain food establishments, including grocery store cafés and convenience stores, as well as those managing vending machines soon need to comply with the laws too. These businesses may know less about menu labeling than traditional restaurants and will be receptive to RDs’ expertise. Before 2010, several municipalities enacted local menu labeling legislation that differed from state to state regarding terms, violation penalties, etc. It became quite confusing, particularly for chain restaurants with interstate locations. The NRA and other organizations openly supported a federal law that would standardize legislation nationally and allow restaurants to more easily conform to the provisions. • Restaurants must display calorie values for standard menu items on menus or menu boards. • Restaurants must have available, on request, the following additional information about their standard menu items: calories from fat, total fat, saturated fat, cholesterol, carbohydrates, fiber, sugar, protein, and sodium. • Restaurants must post a statement in the context of a recommended daily total calorie intake. Salad bars and other self-serve items standard on the menu also must have this information available. The law includes a list of exemptions to the rules, such as nonstandard menu items (specials, short-term menu items, condiments, etc). Calorie values for combination meals (so-called variable food items), such as a pizza with a choice of toppings or a meal with a choice of a side dish and beverage, may be displayed as ranges. Restaurants with fewer than 20 locations can choose to comply with the law; they must register with the FDA every other year to have the benefits of federal preemption and liability protection. The proposed requirements apply to restaurants “and other retail food establishments,” including bakeries, delicatessens, coffee shops, and convenience stores. Businesses such as movie theatres, bowling alleys, and the like would be subject to the law only if they present themselves as a restaurant or if more than one-half of their floor area is dedicated to food sales. Many people want nutrition information available for the restaurant foods they purchase. According to a survey by Technomic, Inc, nearly nine of 10 New Yorkers said they favor menu labeling because they believe it helps them make better food choices when dining out.9 However, others disagree. They argue that menu labeling puts a damper on the dining experience. Some consumers fear that restaurant prices will increase or that this will be the beginning of more regulations to come. Of course, those who oppose menu labeling at eating establishments often are the restaurant owners and managers who don’t want to incur the added expense of complying with the labeling laws. Supporters of menu labeling claim these laws are an effective tool to combating obesity and other diet-related diseases. They say consumers should be entitled to information that will assist them in making better food choices. Consumers consistently and significantly underestimate the number of calories they eat at restaurants,10 and they need guidance. Critics argue that personal responsibility is the main issue, and that the government shouldn’t intervene. They say menu labeling goes too far because the government shouldn’t tell people what to eat and what not to eat. However, according to consumer polls, transparency is what most people cite as the heart of the issue, and most support the legislation. Government is, in part, responding to diet-related public health problems by requiring nutrition labeling, but these laws are considered to play a small part of a comprehensive approach to combating obesity. Mandating this information is providing consumers with the tools to make informed decisions. Will Menu Labels Really Reduce Chronic Disease? Obesity and chronic disease reduction are common arguments used to support restaurant menu labeling. In 2008, the New York City Department of Health and Mental Hygiene estimated that menu labeling could reduce the number of people suffering from obesity by 150,000 over the next five years, preventing more than 30,000 cases of diabetes. A health impact assessment done in Los Angeles estimated that restaurant calorie postings would prevent 41% of the 6.75 million-lb average annual weight gain.11 The UC Berkeley Center for Weight & Health calculates that calorie labeling in California could reduce caloric intake by more than 9,000 kcal per person annually, avoiding almost 3 lbs of weight gain. While these estimates are encouraging, they haven’t been proven. Results of the dozens of studies, surveys, and focus groups on consumer attitudes and behaviors concerning menu labeling are far from conclusive. The menu labeling legislation that went into effect in New York City in 2008 provided many observational opportunities, and several studies compared before-and-after purchasing behaviors, calorie consumption, and effectiveness of the labeling. Some studies reported a positive impact while others reported no impact at all. Just as some people use the Nutrition Facts panel on packaged foods to make food choices while others do not, restaurant goers are all different regarding how they use (or ignore) restaurant nutrition information. While several studies show consumer behavior change can result from menu labeling,12 currently there’s no sufficient evidence stating that menu labeling, in and of itself, is an effective way to combat obesity and chronic disease. Rather, it provides information that can be used as a tool for education so people can make informed food decisions, hopefully to maintain or improve their own health and well-being. Despite mixed study findings on the effectiveness of menu labeling on food choices and behavior and its influence on the obesity epidemic, no one can ignore the fact that people want nutrition information. They also want healthful, tasty, balanced meals. Smart restaurateurs appreciate the value that dietitians bring to the table and understand the importance of customer loyalty. For nutrition professionals to effectively sell their services to restaurants, they need to be armed with persuasive evidence that illustrates their value. RDs make the perfect partners for restaurants that care about the accuracy and quality of nutrition information they provide. A restaurant needs to protect its credibility. Restaurant nutrition consulting involves a high level of skill, knowledge, education, experience, and responsibility, and dietitians are the best fit to ensure that nutrition information is accurate and doesn’t mislead consumers. And if food labels or nutrient claims are involved, dietitians are familiar with FDA regulations. Dietitians know food trends and understand how to apply health claims such as “low carb,” “gluten free,” and “no added sugar.” Knowing that an expert can back up these claims gives customers the confidence to believe in their validity when choosing menu options. This leads to repeat business and referrals, which is every restaurant’s bottom line. Dietitians are the best choice to help restaurants comply with menu labeling laws. Menu analysis is a significant undertaking and a potential source of stress without expert input. The experienced RD can tackle this project, leaving restaurant staff to focus on what they do best: prepare delicious food for customers. Dietitians know that a restaurant is a business, and businesses must turn a profit. They know that being sensitive to the financial challenges of restaurateurs is an important part of forging a successful working relationship. When setting fees, a little creativity and flexibility regarding bulk pricing, package deals, and other compromises may, depending on the situation, result in a win-win. RDs also are aware that chefs are passionate about the foods they create and may be resistant to standardizing recipes and following guidelines that ensure consistency and accuracy in recipe analysis. It’s important to respect the need for creativity and agree on ways to retain the food’s high quality while providing accurate, reliable information. For nutrition professionals, there’s no better time to explore career opportunities in the restaurant industry. Restaurateurs need our expertise on many levels to provide healthful foods and accurate nutrition information in creative, innovative ways during a time when obesity and chronic disease is at an all-time high. And without a doubt we can make a difference. — Dina Aronson, MS, RD, is founder of Welltech Bistro, a restaurant nutrition consulting company, offering unique interactive nutrition software for restaurant websites. • The Academy of Nutrition and Dietetics (the Academy) offers a four-module online certificate of training program called “Restaurant Menu Labeling: The Impact on the Environment of Nutrition and Dietetics.” Each module is sold separately. For more information, visit www.eatright.org/cpd/online. • The FDA updates its website whenever there’s new legislation or information on restaurant menu labeling laws. For more information, visit www.fda.gov/Food/LabelingNutrition/default.htm. • To protect yourself legally, make sure you have appropriate liability insurance in place. Always prepare contracts, outlining the scope of the project that both parties agree to and sign (remember to include timelines, expectations, courses of action, etc). Be sure to include specific disclaimers (regarding limitations of analysis, food variability, liability, etc) not only between you and the restaurant but also disclaimers that the restaurant itself should use with its customers. It’s a good idea to have an attorney review all documents. For more information about legal issues from the member section of the Academy, visit www.eatright.org. • To prepare yourself to work in restaurant nutrition, it’s important to seek specific training, education, and networking opportunities with fellow professionals. Resources regarding restaurant foodservice operations (eg, customer relations, inventory management, procurement, kitchen hierarchy, production); restaurant marketing; advanced cooking methods; menu planning; recipe analysis, development, and modification; food retailing; food safety; food allergies, etc, can be found within the Food & Culinary Professionals Dietetic Practice Group at www.foodculinaryprofs.org. Other great resources include the International Association of Culinary Professionals (www.iacp.com), the National Restaurant Association (www.restaurant.org), and the American Culinary Federation (www.acfchefs.org). 1. 2012 Restaurant Industry Pocket Factbook. National Restaurant Association website. http://www.restaurant.org/pdfs/research/PocketFactbook_2012.pdf. Accessed May 13, 2012. 2. Energy balance and weight management. In: Report of the DGAC on the Dietary Guidelines for Americans, 2010. http://www.cnpp.usda.gov/Publications/DietaryGuidelines/2010/DGAC/Report/D-1-EnergyBalance.pdf. Accessed May 13, 2012. 3. Chef survey: what’s hot in 2012. National Restaurant Association website. http://www.restaurant.org/pressroom/social-media-releases/images/whatshot2012/What%27s_Hot_2012.pdf. Accessed May 13, 2012. 4. New menu and vending machines labeling requirements. US Food and Drug Administration website. http://www.fda.gov/menulabeling. Updated June 9, 2011. Accessed May 13, 2012. 5. Code of Federal Regulations: Food labeling; calorie labeling of articles of food in vending machines; proposed rule, 21 CFR Part 11 and 101 (2011). 6. Code of Federal Regulations: Food labeling; nutrition labeling of standard menu items in restaurants and similar retail food establishments; proposed rule, 21 CFR Parts 11 and 101 (2011). 7. Code of Federal Regulations: Food labeling; nutrition labeling of standard menu items in restaurants and similar retail food establishments; correction, 21 CFR Parts 11 and 101 (2011). 8. Overview of FDA proposed labeling requirements for restaurants, similar retail food establishments and vending machines. http://www.fda.gov/Food/LabelingNutrition/ucm248732.htm. Updated April 6, 2011. Accessed May 13, 2012. 9. Menu labeling is a hit with New Yorkers, survey finds. Nation’s Restaurant News website. http://nrn.com/article/menu-labeling-hit-new-yorkers-survey-finds. September 3, 2008. Accessed May 13, 2012. 10. Burton S, Creyer EH, Kees J, Huggins K. Attacking the obesity epidemic: the potential health benefits of providing nutrition information in restaurants. Am J Public Health. 2006;96(9):1669-1675. 11. Kuo T, Jarosz CJ, Simon P, Fielding JE. Menu labeling as a potential strategy for combating the obesity epidemic: a health impact assessment. Am J Public Health. 2009;99(9):1680-1686. 12. American Dietetic Association Task Force on Restaurant Nutrition Labeling Research. Task force report on restaurant nutrition labeling research. Iowan Academy of Nutrition and Dietetics website. http://www.eatrightiowa.org/RLR_Task_Force_Report_FINAL.pdf. Accessed May 13, 2012.